Happy Valentine’s Day everyone! I hope you are all enjoying today with loved ones! I am so thankful to have just spent a long weekend with my loves. 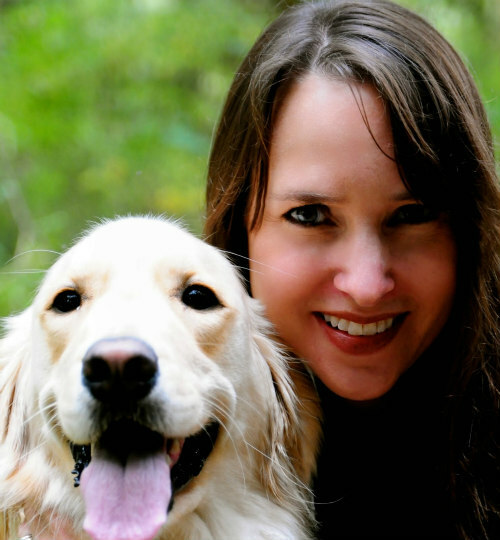 My husband, boys and I (and our golden retriever, Rosie as well) just returned from a ski weekend in Vermont where we spend many of our winter weekends. Our usual routine is to drive up on a Friday after school and return Sunday evening. 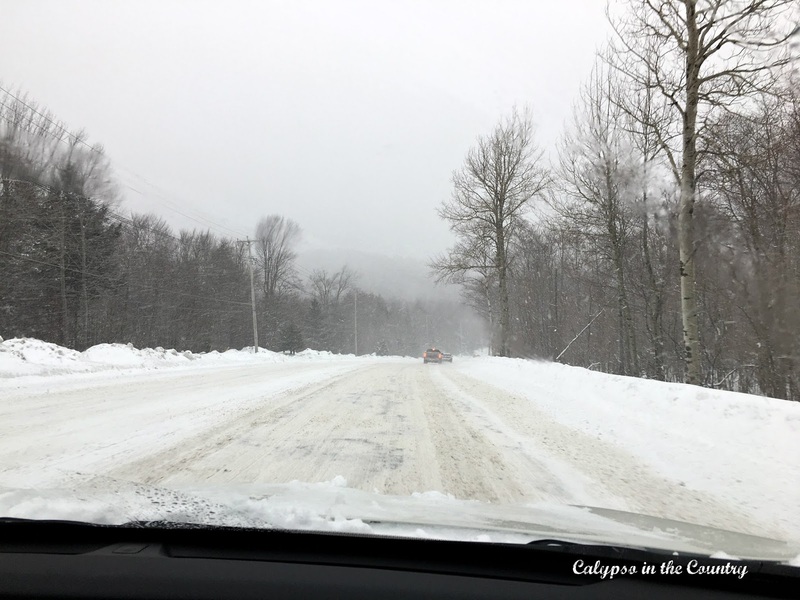 Well, I don’t know if you followed the weather recently, but New England was just hit with a blizzard….I guess we probably should have paid closer attention before we drove up! 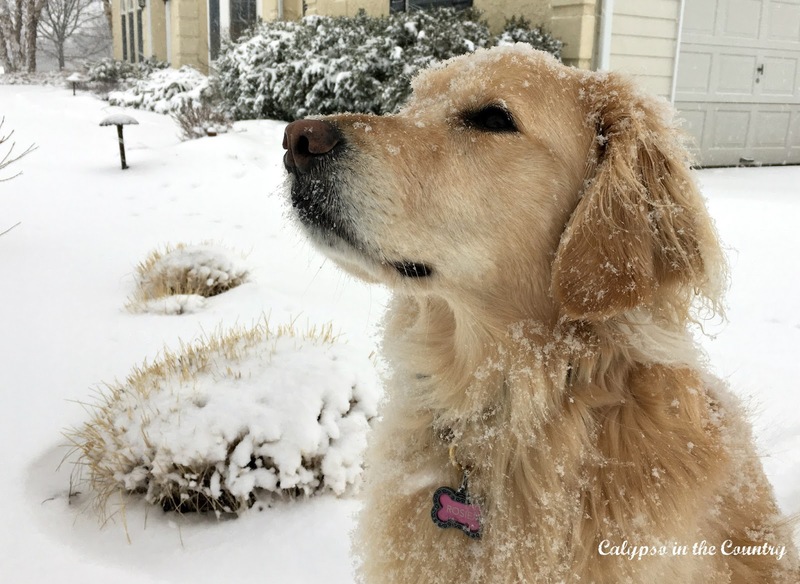 As we continued to follow the forecast, we realized coming home on Sunday may not be an option this time – even if we tried to leave first thing in the morning. The snow was approaching from the south which meant most of the ride home would be through the storm. We made the call to just wait until Monday to drive home. Needless to say, the kids were thrilled to miss school! Instead of waking up early to leave on Sunday, we had a leisurely breakfast and then I drove my husband and boys to the mountain to ski. 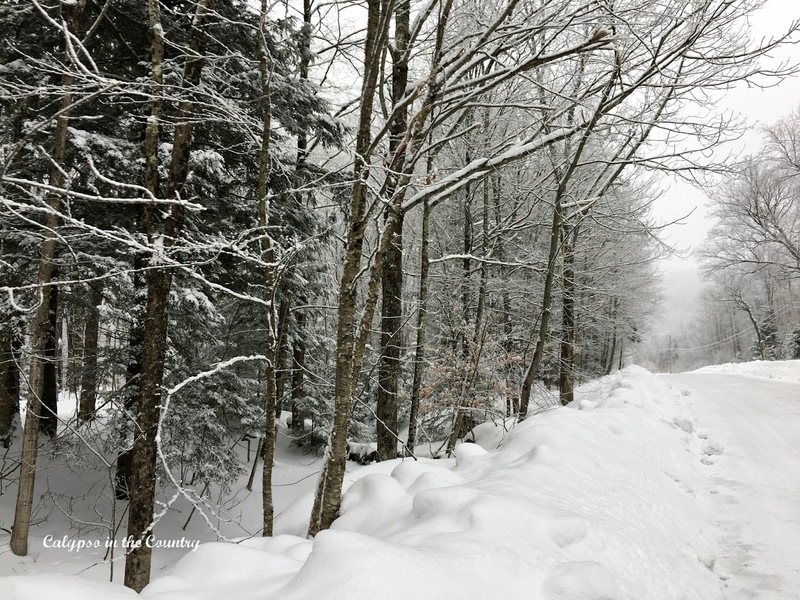 Vermont is having a phenomenal year for snow which is a relief after the bust of a ski season we had last year. Last year was the first year we bought season lift tickets for Killington and we barely broke even. This year we bought them again and have been skiing since early December. Well, my family has, at least. I have only skied a few times because I have been having some neck issues. Most of my life, I have had back and neck issues probably due to a slight case of scoliosis which throws my back out of alignment often. Then in December, I started to have problems again. I even went as far as having blood work to rule out Lyme Disease and Rheumatoid Arthritis. Luckily, they came out negative so I had an MRI which showed some mild compression. I started physical therapy which includes stretches I have to do at home. So far, I have improved slightly but it’s been a slow recovery – and I am getting a little impatient! There are still plenty of ski weekends left this season so hopefully my neck will start feeling better so I can join the boys. 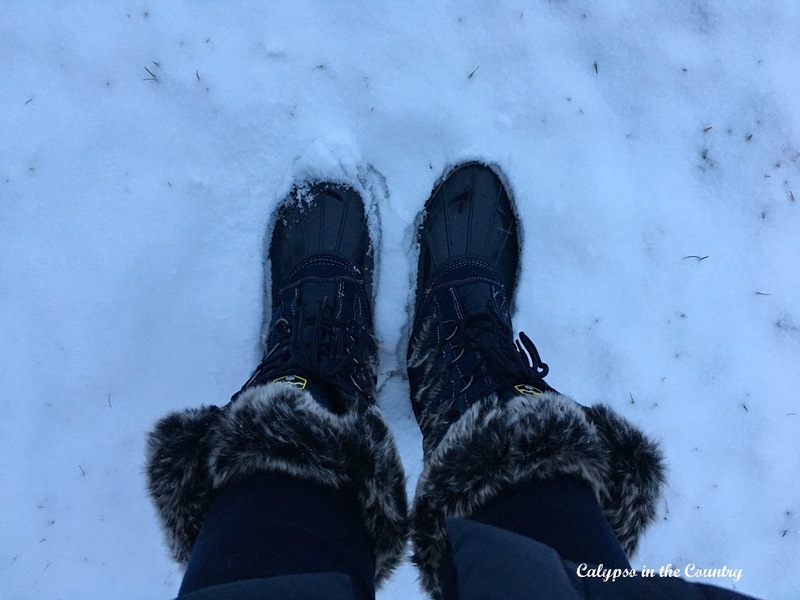 If you are planning a ski weekend of your own, be sure to check out my tips- My Essentials to Stay Warm for a Ski Weekend. There are definitely a few things I can’t live without when skiing! But like I said, the guys have been having an amazing time this year and they took advantage of the excellent conditions this weekend to ski as much as possible! Even though I haven’t been able to ski much this season, I have enjoyed relaxing and going out to dinner at our usual places. 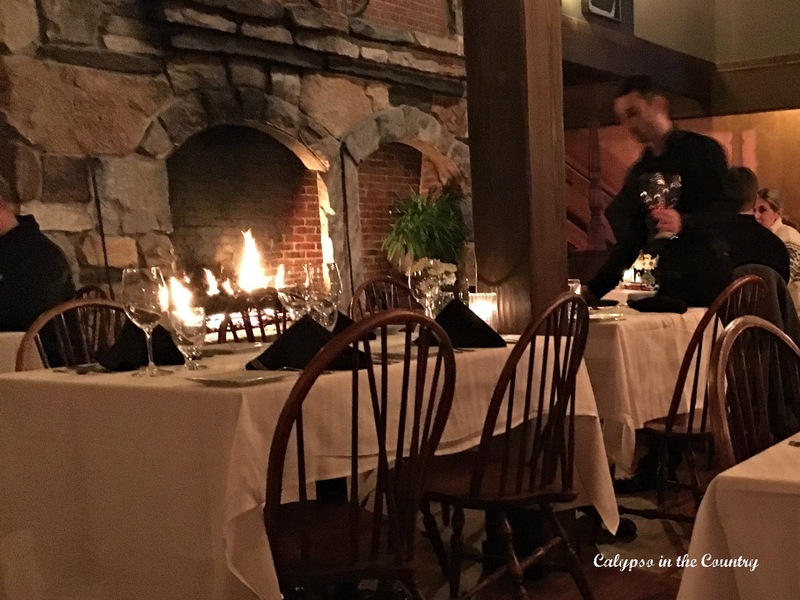 The Foundry in Killington is one of our favorite restaurants to unwind on a cold winter evening and it was an extra special treat to eat there this Sunday since we were “snowed in”. We enjoyed a tranquil dinner by the fire and ended with s’mores for dessert. The perfect way to spend a winter night with the family…much better than battling the blizzard on the long ride back to New Jersey! We finally did make it home safely on Monday. I am glad we waited though! Speaking of New Jersey, we finally got some real snow here last week! I was actually excited for that storm since we had an uneventful winter to that point…a few dustings of snow here and there but nothing significant. The kids even had a snow day on Thursday and spent the whole day outside sledding with the neighbors. As you can see, Rosie savored her outdoor time as well! As much as I love the change of seasons, I definitely lean towards being more of a summer person. But I have to endure some winter weather…especially with my snow loving family. I try my hardest to make the best of it all! I decided to treat myself to some new boots to help make the winter a little more bearable! Please note that this post contains affiliate links which means if you click over and purchase something, I will receive a small commission at no additional cost to you. I can’t believe how many people have complimented these furry things! They are quite cozy and I have been wearing them every chance I get! I guess it kind of bridges the gap from Valentine’s to spring. 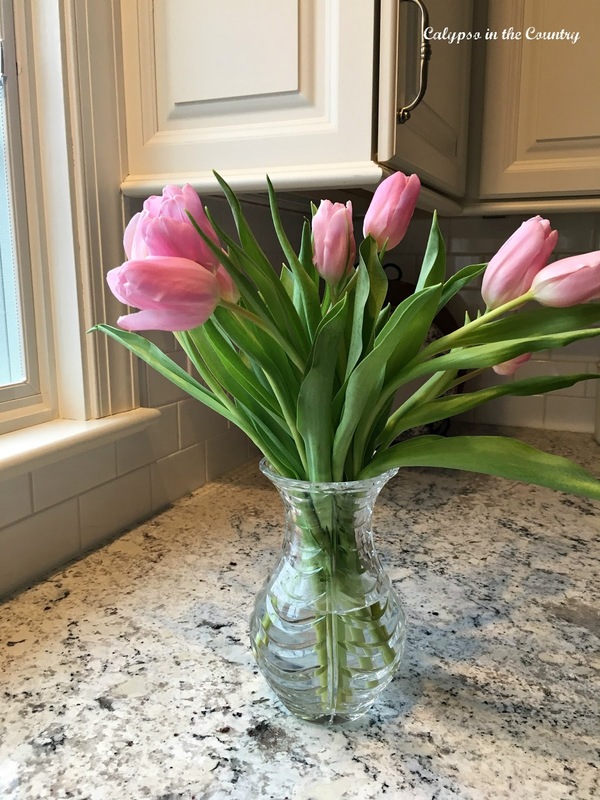 Red tulips…can’t go wrong with them. For years, I have been saying I am repainting my red dining room. Mark my word – this will be the year! Well, that wraps up the all the excitement around here! Enjoy the rest of your week! 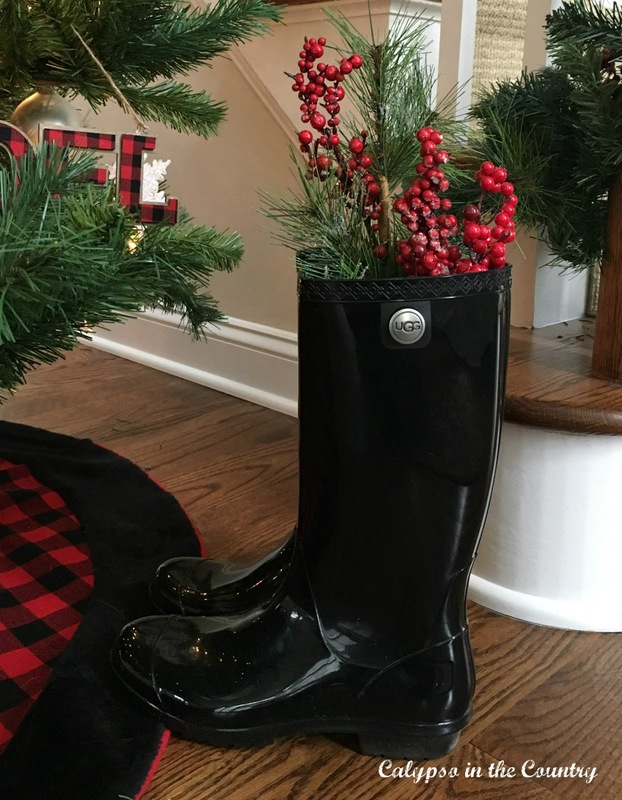 I love those black rainboots, and they make the perfect Christmas decoration. 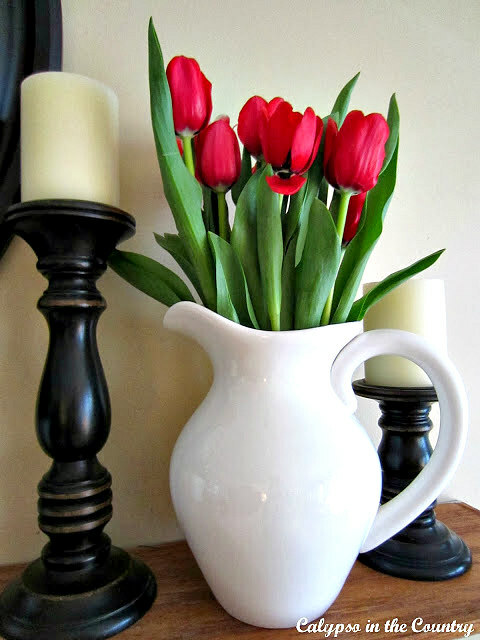 I just bought a similar white pitcher to hold a bouquet of flowers in our kitchen. I love the simplicity of it with the vibrant colors of the flowers. Glad you all got home safe and sound; maybe those of us in the Mid-Atlantic states have seen the last of the snow for this winter. Keeping my fingers crossed. What fun to get away each weekend for some snow fun. We went to Jackson Hole, Wyoming one winter and went snowmobiling and I loved it. No skiing for me, but I love sitting in the lodge and watching those outside when we went on another trip to Colorado. Rosie is so cute in the snow. No snow here this year and it has been super mild. I feel like we skipped winter. Shelley, how nice for your family to enjoy skiing on the weekends . We went to Colorado for many years to ski. My son and hubby are excellent skiers the black diamond kind…just give me a gentle sloping trail and I am good. Happy Wednesday! Glad you decided to stay, that storm was fierce. Fun in the snow! Rosie looks so sweet. Stay warm! Shelley I'm sorry to hear about your neck issues. I hope your PT will solve it so you can hit the slopes by the end of the season! Glad you had a wonderful weekend up in VT! Love those furry boots and rain boots! I love snow but in the south we do not see it very often, in my town about once a season. IT is fun to see your photos though. Sorry to hear about your neck. I broke my ankle and it has been six months…finally recovering. I have been impatient too!! Good luck to you!!! You live in a beautiful area.